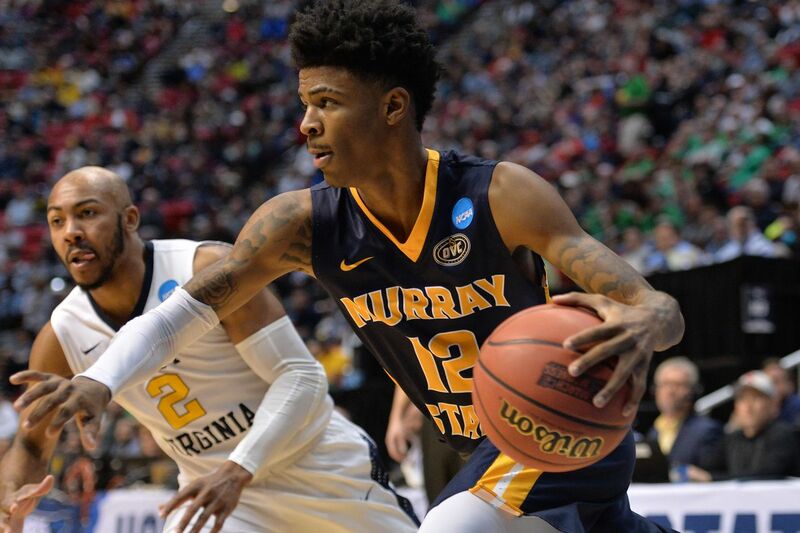 Celtics boss Danny Ainge was in attendance at Murray State last night to watch combo guard, Ja Morant in action. Morant has risen to the top-5 of most mock drafts, so the question some might have is - Why is Ainge looking at a guy he won't have a chance of drafting. Well, first of all, last December, Danny scouted DeAndre Ayton and Rob Williams, both of whom were projected to go in the top-10 in the 2018 NBA draft. Williams slid all the way to #27 in the first round and was promptly scooped up by the Celtics. No one can predict which players may slide - or why they do do. Ja is a 6'3", 175-pound athlete. He is averaging 24 points, 6 rebounds and 10 assists this season and always has some did-he-just-do-that plays each and every game. His slight frame needs some build-up, but his potential is obvious. The draft is months away, and things will change by then. Morant is the type of versatile player any team would want. Boston's guard situation is solid as it stands right now, but there are no guarantees that Kyrie Irving and Terry Rozier will be wearing green next season. Ainge is a gambler and likes to cover all bets. He scouted Williams and picked him towards the end of the first round. Danny was just doing his homework. He always does.